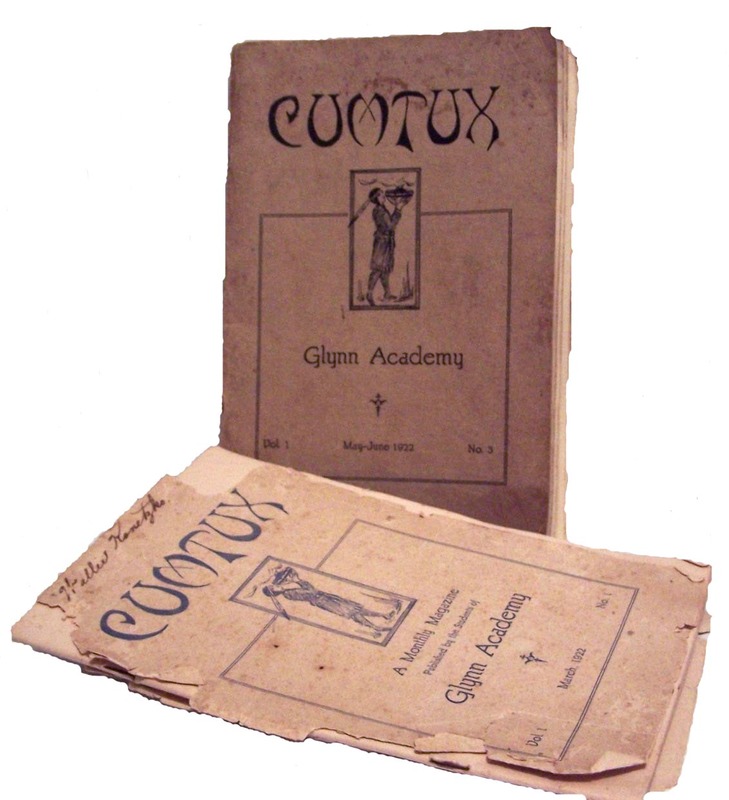 The "Cumtux" was a small monthly magazine published by the students of Glynn Academy. It consisted of news, stories, jokes, advertisements, and various writings of the students of all grades. Volume 1 Number 3 ran much like a yearbook, with photos of each class and a class list. It is unknown by me if this was intended to be the school annual, or just part of the magazine and an annual was also printed. It was suggested by some, that this may have been the school annual. After putting No. 1 & 3 online, I came into contact with Gloria Smith Ramsaur [Class of 1957], who is a co-chairman for the Glynn Academy Alumni Association's Archives for Glynn Academy. Their collection consists of many early photos, a few early yearbooks, and other memorabilia. The G.A. Alumni Association is available for research requests by contacting co-chairmen Gloria or Billy Rogers [Class of 1961], either through the school or by contacting them personally. I will be happy to pass messages on to them for anyone requesting information. They CAN NOT look up school transcripts, etc. The research provided by them is mainly historical, and no personal information on people, living or dead, will be available through them. Two of these magazines [Vol. 1 Nos. 1 & 3] were graciously loaned to me by Stafford Burney, whose mother, Wallie Konetzko, was a senior in the class of '22 at Glynn Academy. When I arrived at the Glynn Academy Archives on 7 May 2004, someone had placed Vol. 1 No. 2 in their display case, the missing volume. It too is merely an editorial magazine with no photos.